You've got mail, my mail. Australia Post can you help? So whose got my mail? This is probably puzzling some of you readers who tune in for photography behind the scenes and the latest HighRPM videos, and I promise I'll be back to normal blogging soon! However I've gone off on a tangent today with the saga of me receiving someone else's mail for the past couple of years which has culminated into the realisation that they have also been receiving mine, it's just that I seem to be missing some! At first thought you might agree that this is an inconvenience, especially if it happens again and again. Inconvenience? Yes indeed, in fact I just had to re-address another two just then. As you can see by my first official notice to Australia Post below though I have been missing mail that is costing me in late fees, and that takes away from Auki's happy place! After calling and being on hold for 20 minutes I decided I'd be better off putting it in writing for reference anyway, theirs and mine. 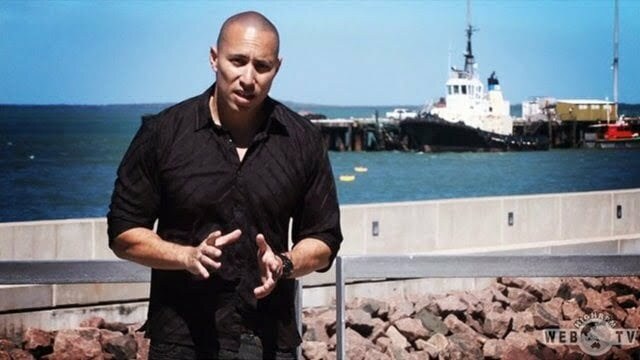 I would like to lodge a formal complaint and have this complaint followed through to a resolution, as the situation we currently have with Australia Post has now eventuated with us not receiving mail, and, in some instances cause us to incur financial penalties in the form of late fees. 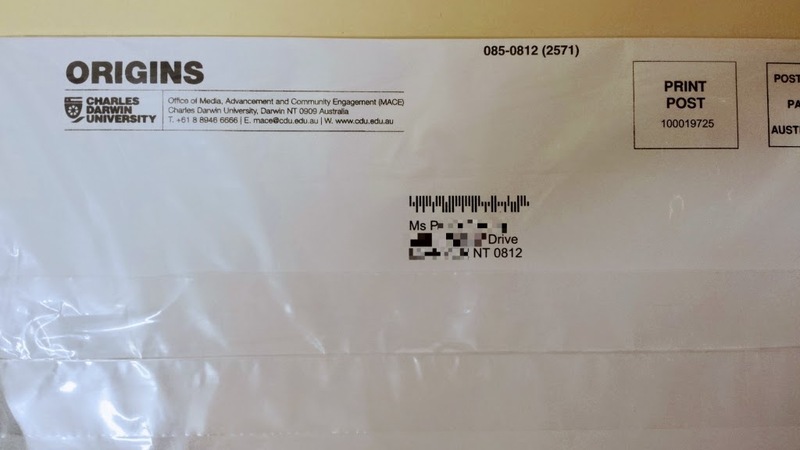 Over the last couple of years we have, on an intermittent but increasingly regular basis been receiving mail intended for another address, one that shares the same unit/number as ours but a DIFFERENT street address. Initially it was thought this was an excusable one off type of mistake and the letters were sent back, with hand written note, to Australia Post for re-delivery. About two months ago totally by chance, a friend who happens to live in the same unit block as this address to which all these letters should have been sent to, spotted some correspondence of OURS in this other persons mailbox as she was taking out the bins. The person whos mail we have been incorrectly receiving and redirecting. It had not occurred to us before this discovery that we were also not getting mail that was addressed to us, due to the same issue. 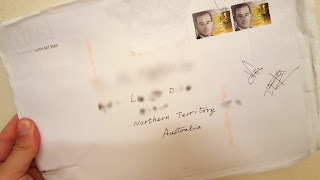 Now with the knowledge that our mail may have been going to the other on many occasions I require someone at Australia Post to rectify this. In the past year we have received at least two late body corp final notices that have indicated we had not paid their original notice for due fees, the original notice that we never received. I paid late fees for this. At this stage I was unaware of the problem with sorting our mail and presumed I had overlooked something. In the last two months my partner underwent surgery and was specifically waiting for her medical bills to arrive, as luck would have it, the first indication of these medical bills was a letter saying that we had overlooked paying the initial bill, my partner immediately took this second notice in to the practice and explained that due to this mail problem we are having she had not received an initial notice for payment. She did not incur a late fee for this. This also leads me to assume that perhaps our incorrectly delivered mail is not being sent on for re-delivery by the receiver? If it had not been for our friend spotting mail intended for us hanging out of this other person's mailbox we might still be ignorant of the situation. 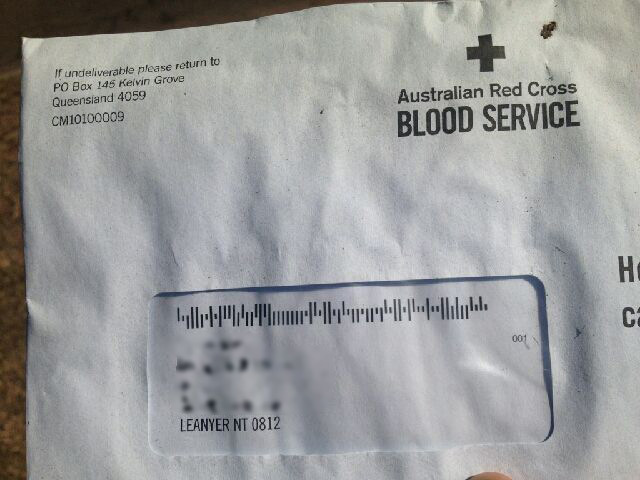 Today I have AGAIN received two more items of correspondence to this SAME incorrect address. I have AGAIN written a note to have them redirected and have taken them both up to the local post box for Australia Post to handle. I will also now be keeping a photographic log of any further occurrence in case you need a reference as to how many times it may happen till this situation is resolved. Points that may (or may not) be of help to your customer service people if they follow this through. These incorrectly addressed items sometimes come bundled in amongst correctly addressed items all bunched together with a rubber band. 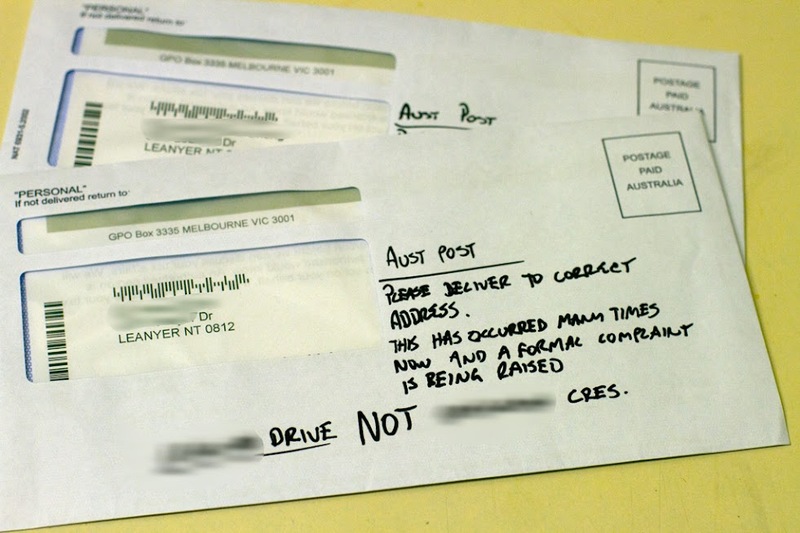 The postie is delivering to the correct address according to the top letter that he can see. 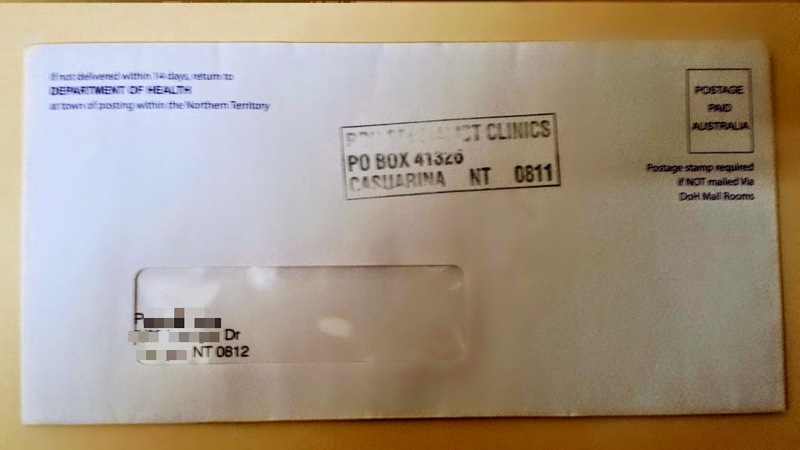 At the Casuarina post office it was suggested to resolve this that maybe we should just get a PO Box. I will not be paying for a service that I should be receiving at my home address. Possibly one to train staff not to suggest as an alternative for Australia Post issues. I look forwarding to hearing from someone soon regarding this. Close, but no banana, our mail at someone else's address. Just as an update, I was sent this mobile picture from the mail box at the other address that has been receiving our mail, obviously this has been blurred out for security here but that is my address on the correspondence. I have the original image should Australia Post require it. I have also requested that my friend does not deliver this to me. It is not her responsibility to perform the carriage of mail for me. 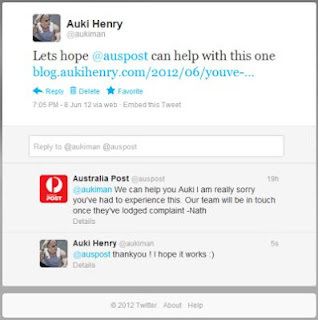 Thank you to Australia Post for replying to my tweet as of the Tuesday ( Monday was a public holiday in many states ). On the same day I also received an email reply (below) back to my lodged complaint form as well, it's good to see the process has started. I'm hoping there is a resolution in sight as I have taken to sending more important correspondence and packages to my relatives home addresses and picking them up from there for the moment. I have to say I'm always glad to see an organistation embrace social networking as part of true customer interaction rather than just as an advertising medium. I am sorry to hear that you are experiencing so many incorrect deliveries. 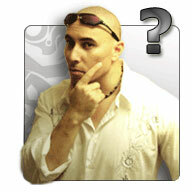 This must be very frustrating for all concerned and i can certainly assist you in this matter. I have forwarded this information to Darwin Delivery Centre to ensure correct delivery of your mail in future. This issue will be addressed with the delivery staff concerned and steps will be taken to ensure your complaint is addressed. . I am very confident that the steps taken by Darwin Delivery Centre will prevent a future recurrence. 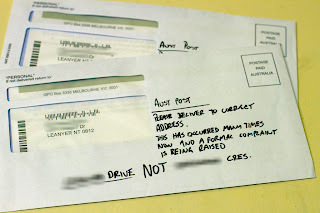 On behalf of Australia Post please accept my apologies for the inconvenience this matter has caused you. If there’s anything else I can help you with please let me know and have a great day. Well, it's happening again, the exact same address, I have re-delivered 3 incorrectly delivered items in the last 2 months and here's another. My hope that it was just a one-off recurrence has been dashed with this fourth item so it is back to documenting once more. If it happens again I will make sure to tweet Australia Post as they seem to be efficient at dealing with issues via Twitter. Yes this is incorrectly delivered item number 5 for 2014 to the EXACT same address as this entire article has been written about. 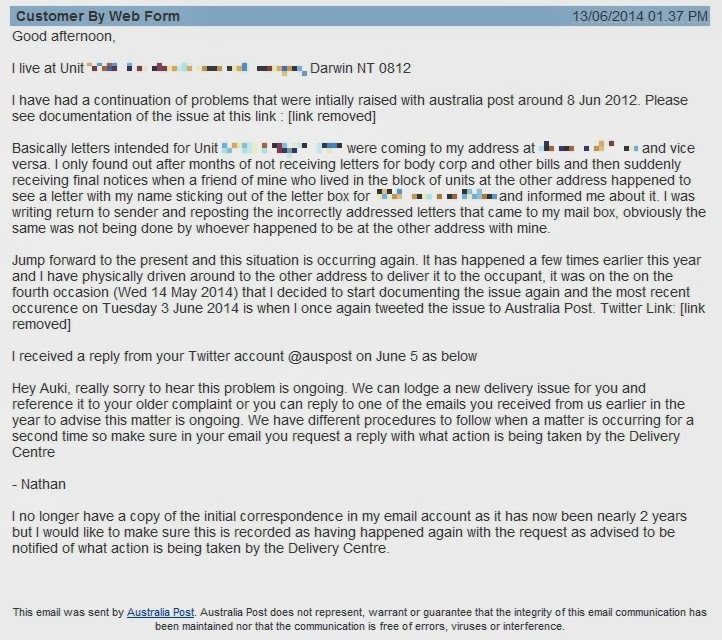 About to tweet Australia Post in the hopes they can fix this again. Last time I incurred financial penalties from bill late fees when my mails were not forwarded to me having been delivered to the other address. 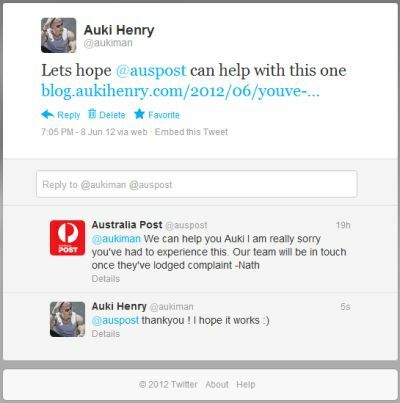 The Official Auki Henry: You've got mail, my mail.